How would you like some spending money for Mother’s Day? I’ve teamed up with ten other fabulous bloggers to bring you this amazing giveaway. One of our readers will win $500 and I am so excited! As moms, we are often times so focused on everyone and everything else around us. But May 10th is about YOU! So…Happy Mother’s Day and good luck!! 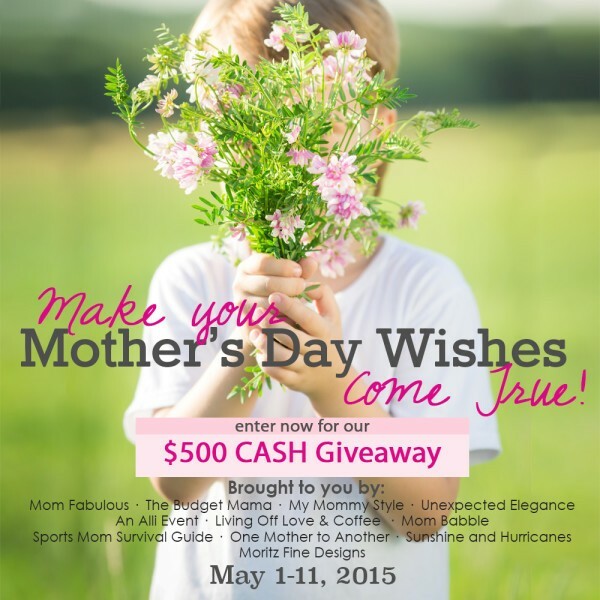 Mother’s Day Giveaway $500 Cash!!! Mom’s you put your heart and soul into every day with your family. We know you wouldn’t have it any other way and that the rewards far outweigh the sacrifices. Whether it’s hearing sweet voices say “Mommy, I Love You” or little hands folded into your big hands, funny faces and belly laughs, first words to first dates; our children make our lives meaningful and fulfilled. However, sometimes being a good mom doesn’t just mean taking care of our families, it means taking care of ourselves. 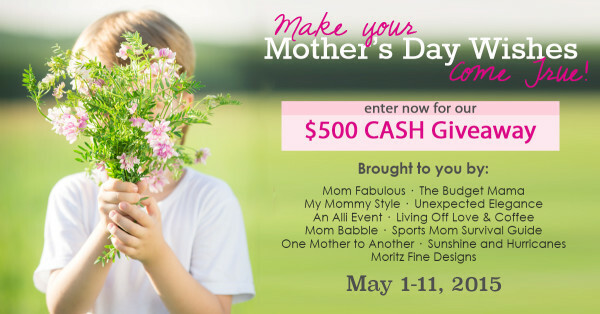 That’s why this group of amazing mom bloggers got together to offer one special mom the opportunity to make her Mother’s Day wishes come true with $500 cash to spend any way she wants. Maybe you’ll buy that new pair of shoes you’ve been dying for or go enjoy a day at the spa or maybe it will just help to relieve some kind of burden you’ve been carrying for too long. However you choose to spend it is up to you, but you can’t win it if you don’t enter. We’ve provided lots of different ways you can earn entries, and with each one you increase your chances of being the mom that’s walks away with the $500 cash!! We wish you ALL the best of luck! Be sure to stop by and visit each of the blogs taking part in the giveaway for all sorts of inspiration and parenting resources. We’re all moms too and we would love to get to know you better! Julie, thanks so much for hosting this lovely giveaway! I just discovered your blog and am enjoying reading your older posts. Thank you so much Debbie! Good luck on the giveaway!! And I LOVE your blog as well 🙂 Those frozen banana bites look AMAZING.